Used a desklamp with copier paper taped to the front as a backlight and positioned a flashlight at the top of the gel candle facing down. The subject was a gel candle we recieved today for a late xmas gift. In PS I performed levels, color correction, and unsharp mask. Zero spot editing performed. I like how you captured this. Those gel environments are kinda cool. Farily convincing. Creative, very nice photo, lighting, and processing are all on point. Interesting, and I'm interested in the setup details. I think that fewer but larger bubbles would be better, don't know if it is possible. I am unable to find the dominate shape in this image. 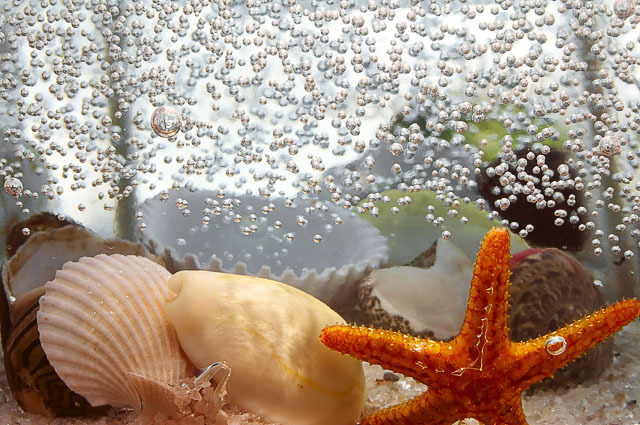 The biological shapes are overwhelmed by the bubbles, but the perfusion of bubbles is more of a pattern or texture element. Proudly hosted by Sargasso Networks. Current Server Time: 04/19/2019 08:18:18 AM EDT.